Learn more aobut carpentry skills. 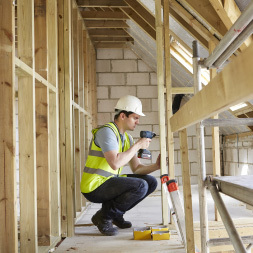 Carpentry is a highly skilled trade and the work carpenters carry out is essential during the construction phase of items as varied as residential and commercial buildings, ships, timber bridges, concrete formwork etc. The main work performed by a carpenter during the construction phase is the cutting, shaping and installation of building materials. In this free online course the learner will be introduced to skills that are essential during the construction phase of any project such as reading plans and elevations so that construction designs can be understood, how to build floor systems for residential and commercial properties, how to build and construct wall and ceiling framing systems, and the methodologies of roof framing. This course will be of great interest to all construction professionals who would like to learn more about the use of carpentry skills as part of the construction process, and to all learners who are interested in carpentry and construction as a career. Having completed this course the learner will be able to: - Identify the various types of construction drawings that make a drawing set; - State the guidelines to read and interpret reading plans and drawings, blueprints, and specifications; - List the various terms associated with floor systems, wall, ceiling and roof framing; - Explain the different methods of framing and constructing houses made of wood; - Describe the types of beams/girders and supports used in construction; - Outline the sequence involved in constructing a platform floor assembly; - Summarize the basic procedure for laying out, assembling, and erecting wood frame walls; - Recognize the different types of roofs used in residential construction; - Determine the length of a common rafter required to construct a roof.